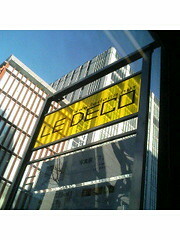 Tonight (Jan. 28) until 7pm and tomorrow until 5pm only there’s an excellent set of exhibits showing at Le Deco, on four different floors. The top floor has photos, including works from Tommy Oshima, Funiku Ookami, and Mario Takahashi. When I stopped by, they all three were there and I had a chance to talk with them all. Mario showed me a couple of his handmade trick lenses and even let me play with them. On another floor you’ll find a installation with some dark, moody 3D work by Tacji Kikuchi (ends today).Other floors have more photos (which I had to rush through because I was running very late) and some CG animation video work. Highly recommended. Go. I plan on going back again tomorrow, with my daughter.